A week ago, we announce that Hoodie Allen will be headlining ERA’s Spring Concert. 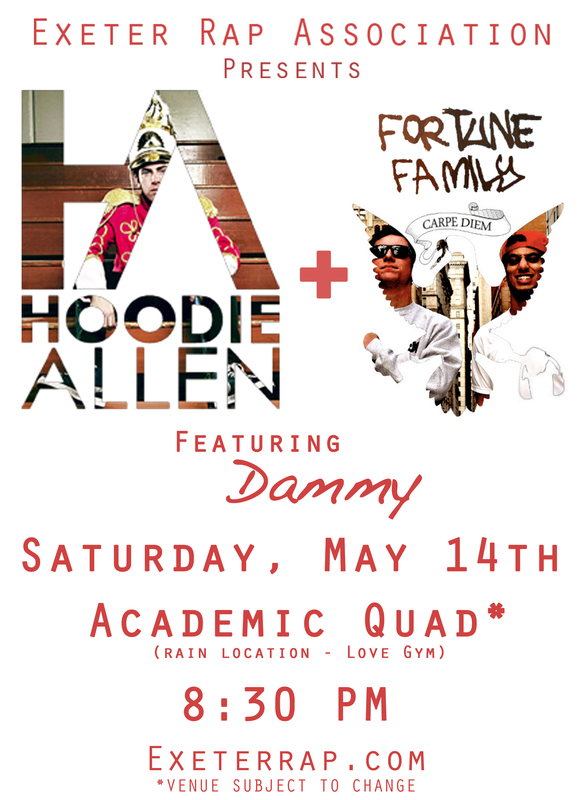 Now, we are proud to announce that Fortune Family will be Hoodie’s opener. Hailing from the suburbs of Philadelphia, Fortune Family consists of Hobson & Reef. Their mixtape, Paradox, and its single, “Take Me Away”, has blown up on the internet, landing them opening slots for Wale and Mac Miller. This will be the second time that FF has opened for Hoodie and the two have collaborated in the past with the song “Lift Off” off Paradox. Dammy is no stranger to the Exeter community. Currently a junior at the Academy, Dammy first made a name for himself when he was the opening act for The Dean’s List last Fall. Two weeks ago ERA released Dammy’s track, “We Alright” off of the ERA Album. He’s been working on some classics since then so be prepared for a solid performance. Unlike the last three ERA concerts, this year’s Spring Concert will take place outdoors on the Academic Quad (subject to change). Hopefully, it won’t rain. But if it does, the concert will take place in the Love Gym. Also, this year’s Spring Concert will be a regional event. Several prep schools in the New England Area have been invited to the event. If you are a prep school student and want to attend the concert, send an email to jharmond@exeterrap.com. This entry was posted in Club News and tagged dammy, era concert, fortune family, hoodie allen, may 14. Bookmark the permalink.